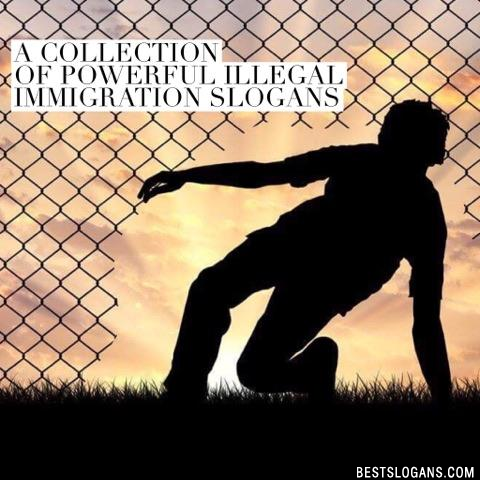 13 new entries added to illegal immigration slogans, that include pictures. 1. If your kids were hungry, youd have snuck across, too! 1 If your kids were hungry, youd have snuck across, too! 2 Now I support my kids. If I get deported, you will! 3 America is a nation of immigrants. 4 Illegals Steal What Whites Have Built! 5 Illegal Immigrants Make a Joke of the Rule of Law and Democracy! 6 Illegals Want What You Have, So They Steal It! 7 Illegals Take Far More Than They Give! 8 Deport illegal immigrant criminals, let the rest stay. 9 Illegals Steal Americans Good Will! 10 Love Thy Illegal Immigrant or Else!? 11 I yearn to be an American. Please help me! 12 No human being is illegal. Stop the madness. 13 America was built in Illegal Immigration. Ask the Native Americans. Can you think of a good Illegal Immigration Slogans we're missing? Or come up with a clever one of your own. Please share below.